I’m going in deep here for a second, so y’all bear with me… Have you ever thought about about how we, as humans, strive for perfection to the extent that we make things infinitely more complicated? It’s like our desire to be perfect negates any practical consideration. We’re always told that that shortest distance between two points is a straight line. But how often do we actually take that direct path? I think sometimes that we’re afraid of simple – we’re afraid it might make us look unintelligent or unskilled. Sometimes we even give certain parts of our lives their own language, you know… to make things complicated. When was the last time you went into Starbucks and ordered black coffee? No, it was a venti, skinny, caramel, macchiato, whatever, whatever… See. Complicated. Now, on my best day, I try to be the opposite. I want things to be simple. I need things to be easy. My dad always taught me the K.I.S.S. principle – Keep it simple, stupid. 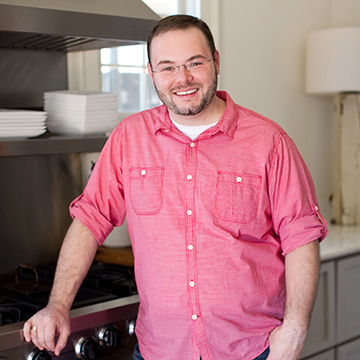 In fact, when I was writing my book, I went back at the last minute and removed the word sauté from nearly every recipe that had it in the instructions. To sauté something literally means to cook in quickly in a little fat. To cook it. So rather than say sauté (which I think might intimidate an inexperienced home cook), I just simply wrote “cook.” See. Easy. 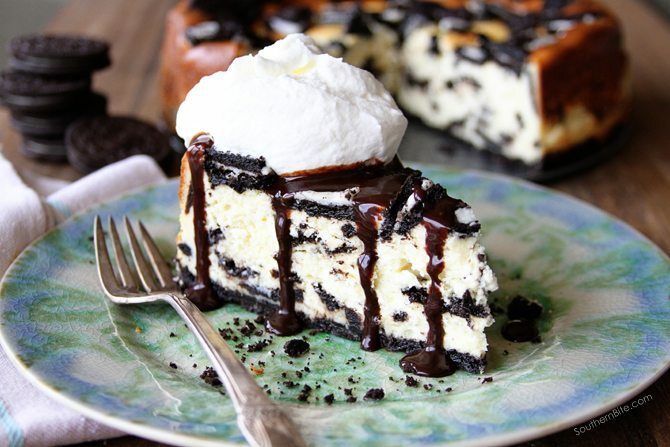 This cheesecake is the perfect example of something that is simple, that can be made infinitely more complicated. Google a recipe for cheesecake and you’re sure to find methods that call for you to cook it in a water bath to keep it from browning or tell you that you’ve got to stand on your head while reciting the alphabet backwards for the last 14 minutes of the cook time to keep it from cracking. Ugh. Complicated. I’m here to tell you… this is not one of those recipes. Yes, this cheesecake will brown – on the edges AND the top. So what. And it will probably crack in the middle too. But guess what? It will taste just the same. Yep, sure will. And if you don’t like the way it looks, drizzle it with some chocolate syrup and add a dollop of whipped cream – heck, even a dollop of Cool Whip… yes, I said Cool Whip. This is seriously the easiest cheesecake. It’s perfect for when you need something UNcomplicated. 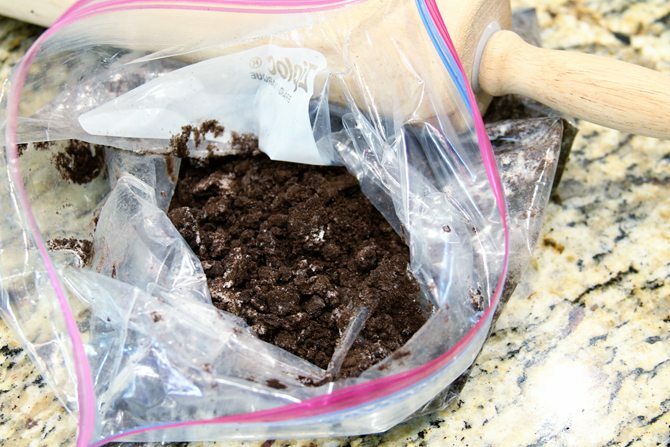 To make it, start by putting about half of the Oreos into a zip top bag. Seal it up and give those babies a good crushing – really take out your frustrations. 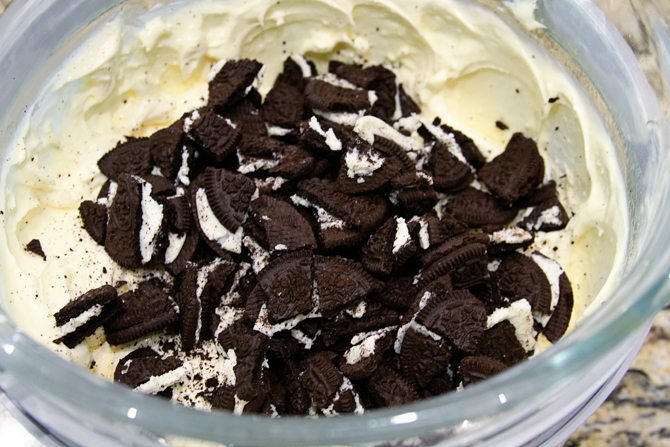 Next, combine those crushed Oreos in a small bowl with the melted butter. Mix well. 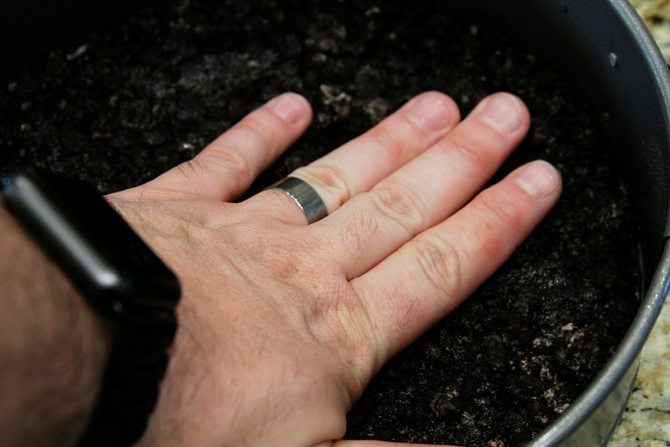 Dump that mixture into the bottom of a 9-inch spring-form pan that you’ve sprayed with nonstick cooking spray. Press them out evenly to form the crust. 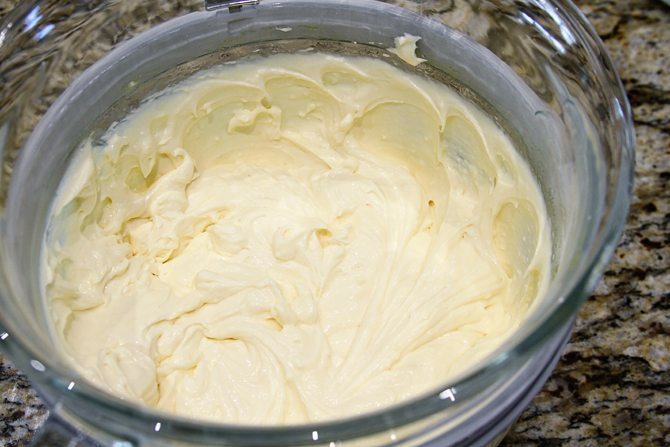 Next, combine the cream cheese, sugar, and vanilla in a stand mixer or with a hand mixer. Mix it really well. Add in the eggs and mix well. 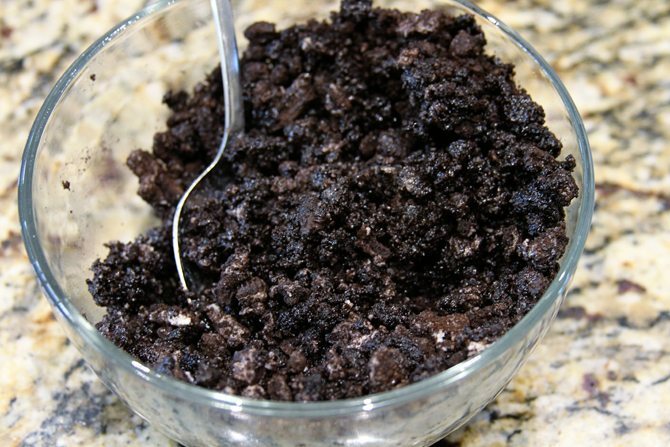 Take the remaining Oreos and break them up into big chunks. 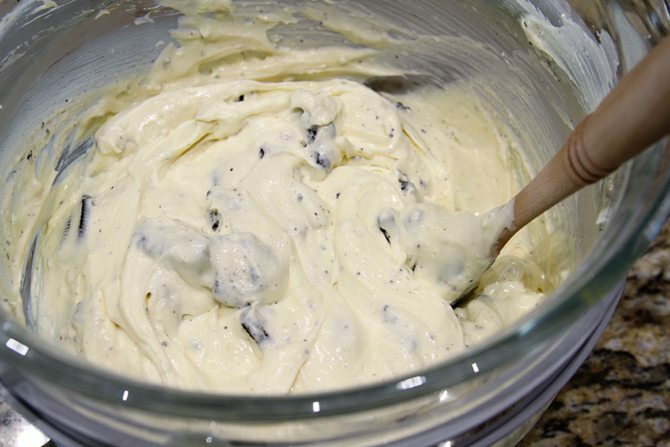 Add most of them to the cheesecake batter, but reserve some for the top. 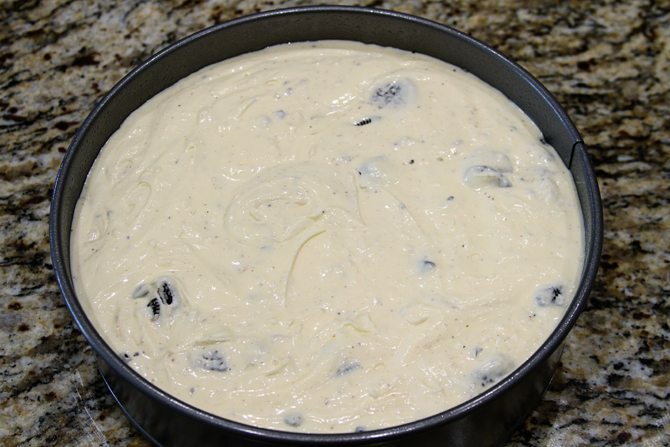 Pour the cheesecake batter on the crust and spread it out evenly. Make sure to tap the pan on the counter a few times to get out any air bubbles. Top with the few reserved broken Oreo pieces. Bake for 40 to 50 minutes, or until the middle is almost completely set – but not all the way set. Remove from the oven and allow it to cool on the counter before refrigerating it overnight for it to firm up. If you’re incredibly impatient (and who isn’t when there’s an Oreo Cheesecake in your fridge) 3 to 4 hours will probably be enough. Do me a favor and Pin this recipe if you like it! 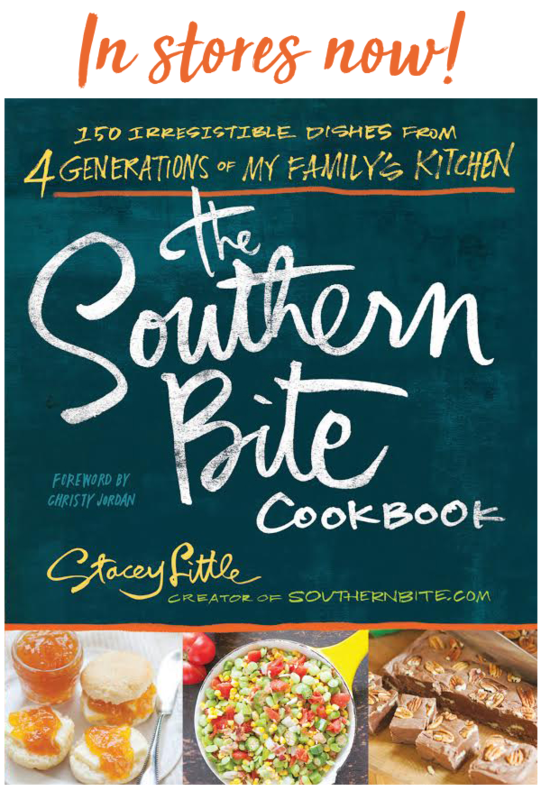 Helping me spread the word about Southern Bite keeps me sharing all these great recipes with you! 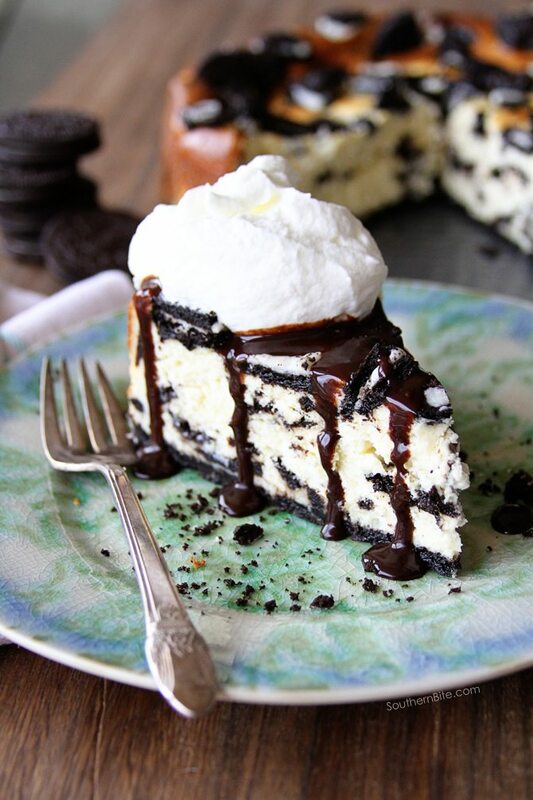 Oreo cheesecake is one of my all time favorites. I make mini ones using a single cookie as the crust. In the instructions that accompany the pictures, you do not mention eggs. Of course, it’s no big deal, but thought you might like to correct it. Recipe looks delicious. Thanks for the heads up! Got it fixed. Enjoy! This looks delicious–and as stated, easy to put together and cook! I do have one question though. When you crush Oreos for the crust, are you supposed to include the frosting or remove most of it?? I have always wondered. What did you do for your version? Frosting and all? I know you are to add butter so does it too oily if the frosting is in there too? Seriously I am NOT trying to complicate things, LOL! Just leave it all in there. It’ll help to bind the crust together. Enjoy! Who could possibly resist this one??? NOT ME! Looks fabulous and mouth-watering. I am sure I am not the only one who appreciates SIMPLE recipes like this one. You are awesome Stacey! Keep on keeping on…. This looks wonderful! Can’t make it unless I’m having company though — I might eat the whole thing. Thank you, thank you, thank you for reminding me that it’s OK to keep it simple! I can’t tell you how many times I’ve let needlessly complicated recipes intimidate me and shake my confidence as a home cook. I’ve looked at recipes that had such intricate, complicated steps––almost scientific––to the point of being almost impossible to re-create. As much as I love to cook, I do have other things I need to do other than stand over a dish and stir it frequently for two hours. Lately, I’ve been rethinking my cooking strategies and picking simple recipes, but I kept thinking that perhaps that was a cop-out, that perhaps I should just tough it out and make the more elaborate recipes; but I would end up frustrated and exhausted and with food that really wasn’t worth all the trouble. This week, you and Brandi (The Country Cook) have posted blog postings that have encouraged me to keep it simple and do my best, and it will turn out just fine. Thanks again! Brandie’s post sure was great, wasn’t it!? Glad we could help this week, Tee! So glad you enjoyed it! It’s a family favorite! OMG I made this yesterday for Mother’s day…My family LOVED it so much…I loved how easy it was to make! I will be making another one on Wednesday for work…cant wait for them to say how good it is…Thank you!!!! I just love hearing that, Mary! I hope you’re coworkers love it as much as your family did! Hi Stacey, Can you tell me how to bake it in the Microwave !!! 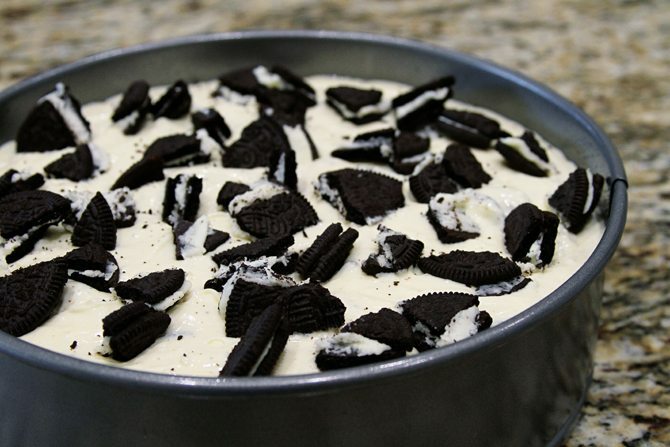 or Can i just refrigerate it like “no bake cheesecake” .. I need your suggestion. I’m actually planning to mk it on my Hubby’s budday 🙂 Thanks fr sch a simple recipe on cheesecake but plz do solve my query Stacey !!! need to cook it or leave them out. That’s so great to hear, Cathy!! Sounds easy but what’s the oven temp? Hi Mona! It’s so easy. The oven temp is 350°F. Do you use regular Oreos or double stuff? This was so easy and SO good. I am so glad I found this receipe. Thank you! Me to! Glad you enjoyed it! How much sugar in batter? You won’t ever get laughed at for asking questions here, Susi! Just let it chill in the fridge before removing it from the pan. You can actually just wait until you’re ready to serve it. Hope that helps! It’s just regular granulated sugar. 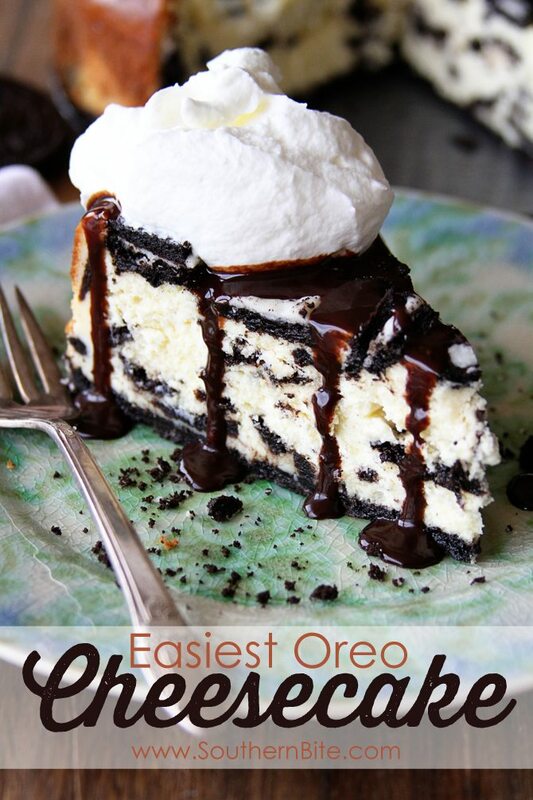 I am wondering how easy it would be to substitute something else for the Oreos. I made this Saturday and my husband went crazy over it (he loves Oreos). We really liked it and think it has the best cheesecake taste of any we’ve ever had. 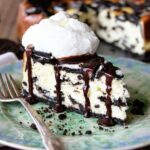 So I guess my question is would it be possible to use the cheesecake base but do like a coffee cheesecake instead of Oreo? Hi Danielle! So glad you enjoyed this one! Yes, this is a great base recipe to add other things too. Just be sure to use things without additional liquid – other cookies, berries, etc. I was wondering could you use this recipe to make individual cupcake using a cookie as the crust? I don’t see why not! 🙂 You’ll just need to reduce the cooking time. Can you tell me why mine tasted like eggs? lol. I have never made one before. Is it 1/4 a cup of sugar or 1 and 1/4 cup of sugar? It’s 1 1/4 cups sugar (1 cup plus 1/4 cup). Did you use less? How long will it keep in the fridge? Or can it be frozen? This recipe looks great! I’m making it tomorrow for V-Day. I’m using a 7inch pan. Does that change the cook time or temp for this recipe? Thanks! Since the batter will be thicker it will probably need a longer cook time, but I can’t say exactly how long. You’ll want the center to still be jiggly and about 2 inches around the edges should be set.